Great news! We just released a free Jalie Application for all iPhone/iPod/iPad owners out there! This means that you can now take your Jalie catalog with you without having to connect to the internet. 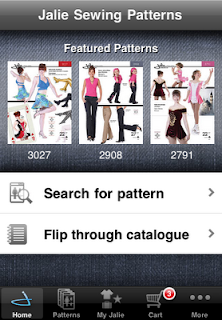 When you have access to a network, you can download and save backs of patterns and instructions for your next trip to the fabric store. The application lets you add patterns to an offline shopping cart and when you are connected to the Internet, simply hit the checkout button to move all the items to our online shopping cart and complete your purchase (the buy 3, get 1 free promotion on www.jalie.com still applies). We also added a Projects section where you can log what you have made (size used, modifications, results, etc) and submit the projects for our Hall of Fame in a few taps. It is such a thrill to see our patterns come to life in such beautiful pieces. I could not help but browse online to find more photos... I stumbled across this funky version of leotard 2792 (view C) with a "slightly" higher leg. Click the link to view more photos of the show. Kudos to Simon and his team for those three months of hard (but ooooh so productive) work. I'm sure it will inspire many skaters out there!